Looking for a site that offers a mountain of games with the potential to win huge jackpots? Ladbrokes Games could be just what you need. This top quality site is part of the hugely popular Ladbrokes brand. Known as one of the biggest bet makers in the UK, over the years the site has launched several sister sites as online bingo and gaming has grown. Making use of Playtech software, you’ll struggle to find better quality games than the ones found here. With excellent promotions and a safe, secure design, Ladbrokes Games is one of the best sites currently available. It is regulated by the Gibraltar Gambling Commissioner. 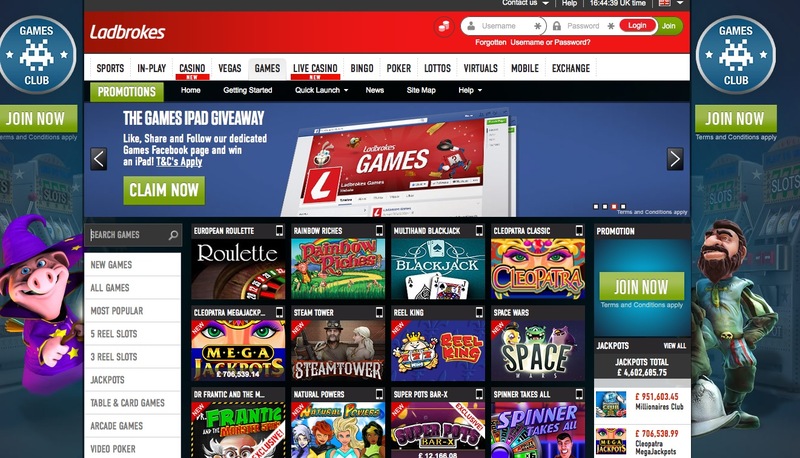 So, what games can you expect to find on the Ladbrokes Games site? Well, you’ll actually find a massive selection of games to suit everyone. There is a strong focus on slot games; you can choose from three and five reel slots, as well as big money slots. Some of the best jackpot slots to check out include ‘Cleopatra Mega Jackpots’, ‘Deal or No Deal Jackpot’ and ‘Siberian Storm Mega Jackpots’. The prizes on offer in these big jackpot games range from £6,000 to over a huge £500,000. The jackpots keep increasing every second until they are won. Other games available include video poker, virtual sports, scratchcards, keno, table and card games. There really is something for everyone and the potential to spend hours of fun on the site each day. You’ll be impressed by the professional, flawless design of Ladbrokes Games. It definitely makes the site more enjoyable to play on. Everything is super-easy to find and it has a clean, bright design with everything laid out in an attractive manner. Recently the company has added an exclusive ‘Games Club’ which aims to reward loyal players. It runs from Monday to Thursday and gives you the chance to win random bonuses. You need to opt in to the club and to win bonuses you simply need to play your favourite slot games. You can also play on your tablet or mobile. There’s a wide range of promotions and bonuses available. Check the promotions page for up to date offers.